The Tactical Blue-Dot™ Series was designed to be an essential article of police gear, with features that every patrol officer, military or security personnel would need to give them an advantage in an assault situation. No other line of LED flashlights offers the intensity or quality of light from a tactical flashlight this size. This line of police gear is virtually indestructible, with a mil-spec, black anodized aluminum casing that is waterproof, shock-proof, and designed with a unique, ergonomic grip. Both the front and rear of the barrel have strike-crowns that are designed for maximum impact for pressure point, defensive, and weapon retention techniques, allowing a Brite-Strike tactical illumination flashlight to be used as a fast draw impact weapon. 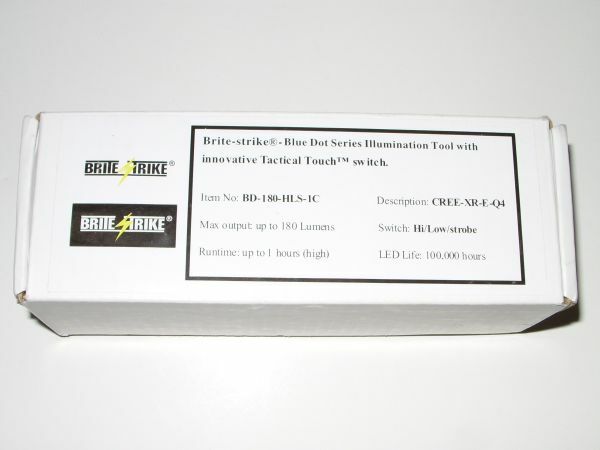 A Brite-Strike Tactical Blue Dot Flashlight makes a great gift for law enforcement, SWAT and police personnel. Enhance the safety and security on and off duty for your loved one! Warranty Lifetime Limited Warranty against the mechanical operations of the flash light. Warranty covers only the original purchaser and does not include normal wear and tear. 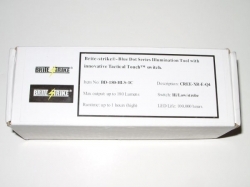 The packaging of the Brite-Strike BD-RL180-HLS-1C 1 is simple. 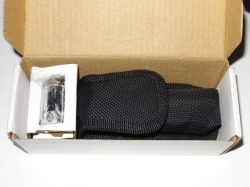 There is a box; inside that box is a Black Ballistic Nylon Holster that contains the flashlight. Beside the holster there is a battery. And an Owner’s Manual. There isn’t much to this products packaging as they don’t expect you to baby this light. And why would you? It’s meant to be beaten up…I think it secretly likes it.